The U.S. bank prime rate remained unchanged in the first half of February, at 3.25 percent. Most of the credit card categories tracked by this survey were also unchanged, with one exception. The average student credit card rate rose by 20 basis points, to 17.55 percent. This increase bucked a broader trend towards lower interest rates. Looking at the bond market and at mortgage rates, one might have expected that a significant drop in credit card rates was in order. From the first week of January to the first week of February, 10-year Treasury bond yields dropped by 33 basis points. Thirty-year mortgage rates fell by 30 basis points over the same period. Why were these interest rates -- which had risen overall in 2013 -- suddenly heading south? The main reason was that a string of disappointing economic reports raised fresh concerns about the economic recovery. Job growth, new home sales, and manufacturing all delivered disappointing results, sending both stocks and interest rates sharply downward. Against this backdrop, most credit card offers tracked by this survey were unchanged, and the one alteration resulted in an increase in rates rather than a decrease. Having not fallen as much as other interest rates in recent years, credit card companies have left themselves an ample cushion against short-term ups and downs in rates, and within individual credit card offers, wide spreads between rate tiers allow credit card companies plenty of latitude to react to rate trends without changing their offers. Another factor where credit card companies are concerned is that the same signs of weakness that send some interest rates lower also heightens concerns about credit quality, which would tend to push credit card rates higher. More so than lenders who make secured loans, card companies extending unsecured credit have somewhat offsetting considerations regarding the impact of the economy on their rates. For consumers, the stability of credit card rates is a mixed blessing. It is easier to make informed choices in a stable market, but part of that stability is because credit card rates in general are so high relative to many other interest rates. 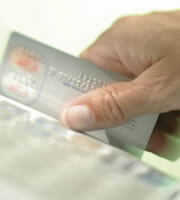 Consumer non-rewards and rewards credit card rates remained unchanged, at 15.48 percent and 17.64 percent, respectively. These rates have been very stable of late, with no change in either category since October. The rise in student credit card rates was the first for this category since early September. The recent change was due entirely to a change in product availability by one credit card provider. Interestingly, the lowest rate tier from this provider remained the same as it had been for their previous student credit card offering, but the highest rate tier on their current offering is now 3 percent higher. This is an example of how credit card companies leave themselves broad latitude to increase rates without hurting their competitiveness at the lowest rate tier. Business credit card rates were unchanged for the second consecutive survey. With consumer credit card offers having remained stable for more than three months now, there has been no change in the spread between rates for customers with excellent credit and average rates. That spread remains at 3.93 percent. The lack of any recent widening in this spread suggests that despite mounting concerns about the strength of the economy, credit card companies have yet to show any new concern about consumer credit quality. 0 Responses to "Student credit card rates rise"